Granulocytes have two types of granules primary and secondary. Primary granules are azurophilic, most numerous and prominent at the promyelocyte stage (see morphology of myeloid precursors) and diminish in number with further maturation. As the granulocyte matures the staining characters of the primary granules changes. They initially become violet and then became inapparent because they fail to take up stain. The secondary granules appear in the myelocytes and persist for the rest of the ice of the granulocyte. 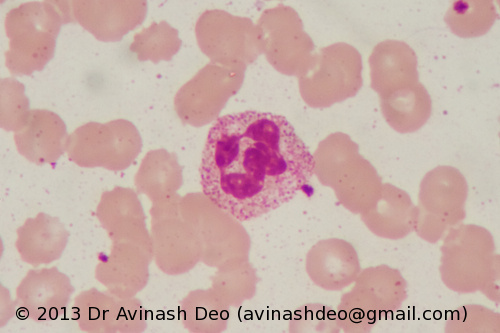 Neutrophils have fine pink secondary granules.